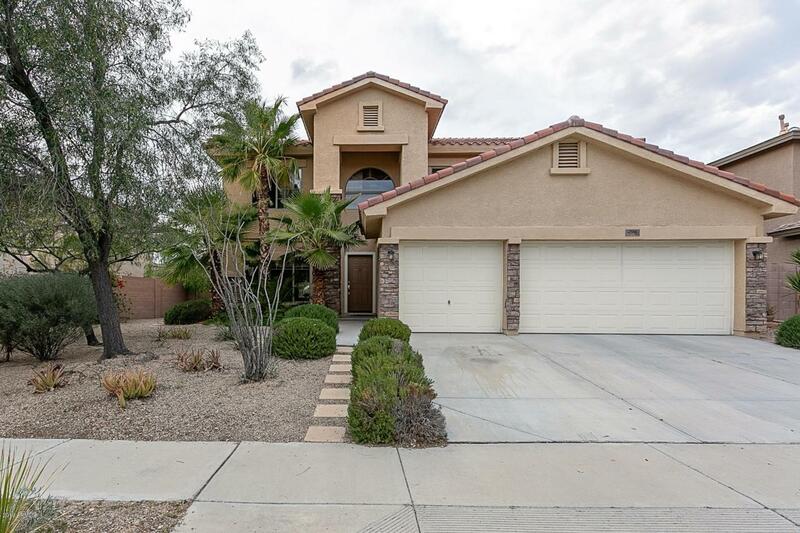 5 Bedroom, loft, 3 bath well-maintained, freshly painted home in the gated Amber Hills community. Mountain views from this north/south facing home. 3-car garage, wired for surround sound. One bedroom (10'x10') and full bath downstairs, master upstairs. 3 gas fireplaces: formal living room, 3-way fireplace in kitchen and family room and 3-way fireplace in master bath. Kitchen features stainless appliances with smooth top electric range. Master bath offers separate soaking tub and walk-in shower, dual sinks and spacious walk-in closet. Lushly planted backyard has covered patio. Accessible location close to I-17, Loop 303, Loop 101, entertainment, shopping, restaurants, banking and medical. New gas water heater 2017.